The scene of the crash in Milford, Maine. 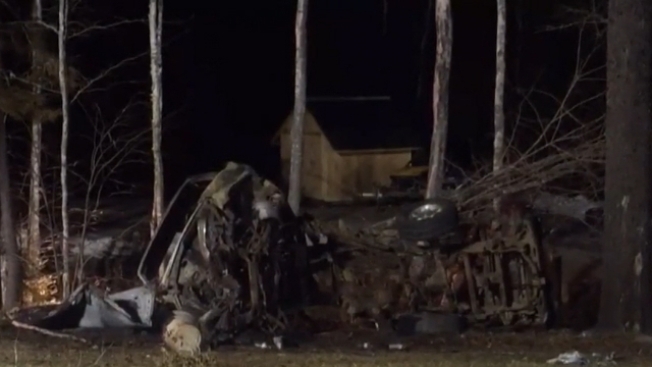 Police say one person was killed when a pickup clipped a utility pole, rolled over and caught fire in Milford, Maine. The incident happened in the 800 block of County Road around 1 a.m. The Penobscot County Sheriff's Department identified the victim as 28-year-old Matthew Spencer of Greenbush. The department says two others were hurt including the driver, 21-year-old Nicholas Spencer of Greenbush and 29-year-old Samuel Ketch of Milford. Nicholas Spencer was transported to Eastern Maine Medical Center with life threatening injuries. Ketch was transported as well but with non-life threatening injuries. County Road at Baker Brook Road in Milford was closed while officials investigate and reconstruct the crash. The Sheriff's Office said excessive speed and alcohol were likely factors in the crash. Just before the crash the occupants of the vehicle stopped at the Milford On the Run and had an interaction with another group of people. The Sheriff's Office is hoping to speak with those individuals.